The process is remarkably easy. To open Teaching Assistant, the user selects the [Application] key on the devices control panel. The [Print Test] button is pressed to enable entry of student ID bubbles, and the number of questions, choices and students. The green [Start] button initiates printing of the custom bubble sheets. The tests and sheets are distributed to the students, who answer each multiple-choice question by shading the appropriate bubble on the form. 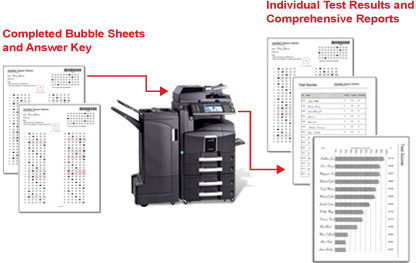 The completed forms and answer key sheet (which prints along with the blank bubble sheets) are placed on the devices document feeder. The Teaching Assistant application is opened again, only now the [Grade Test] button is selected. 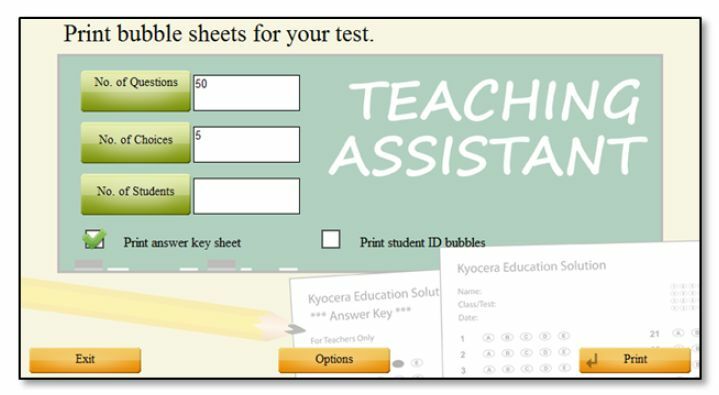 Teaching Assistant instantly scans the sheets, scores each student and prepares a series of analytical and graphical reports, with a choice to print, save to USB flash drive or e-mail the results. To protect student confidentiality, all data related to the test is automatically cleared from the device, after the user exits Teaching Assistant. A turn-key solution to benchmark student performance, Teaching Assistant helps prepare students to meet state-mandated goals, while also supporting compliance with No Child Left Behind (NCLB) legislation. Beyond the K-12 classroom, Teaching Assistant is also a valuable tool for organizations that conduct internal or external training programs. Ideal for all educators, Teaching Assistant reduces the paperwork burden that otherwise distracts from the core mission preparing our leaders of tomorrow. No server or PC is required to use Teaching Assistant. Both standalone Kyocera copiers and network MFPs support Teaching Assistant. Tests can be created on-the-fly. If some students are struggling in a particular area, math and/or science for example, teachers can create a test to fill specific learning gaps. Teachers have immediate access to test results; remedial work can commence, if necessary. By automating test workflow, teachers can spend more time with their students. Routing test results to email saves paper, toner and energy. Test reports are accurate; human error is taken out of the equation. Teachers can boost test scores by performing more frequent testing. Students become more proficient and comfortable with the test process itself.